Leeks and frost-kissed farm share spinach, sautéed with chicken and cranberry salsa in a creamy enchilada, topped with spicy salsa verde. Want more enchilada recipes? Try my Clickable Collage. More recipes using spinach? Here's the Spinach Recipes Collection. More recipes using Leeks? Try this collection. 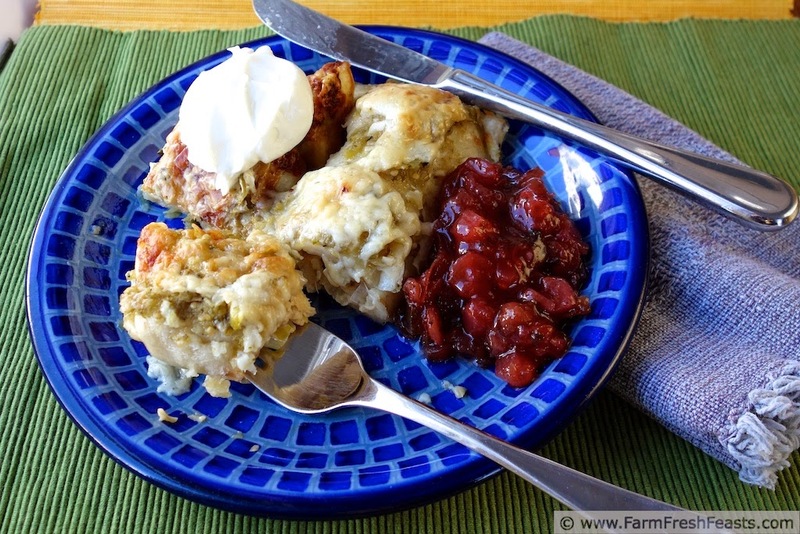 More recipes using Cranberries, in various permutations? Look here. Preheat oven to 375 degrees Fahrenheit and a large skillet over medium heat. Spread a cup of salsa verde across the bottom of a square baking pan (mine is 9 inches) or an oval casserole pan (you're looking for 2.5 to 3 quart pan size). Add a turn of oil to the preheated skillet, and sauté the leeks for 5 minutes until they start to soften. Add the spinach to the skillet and sauté with the leeks until wilted, another 3-4 minutes for me. 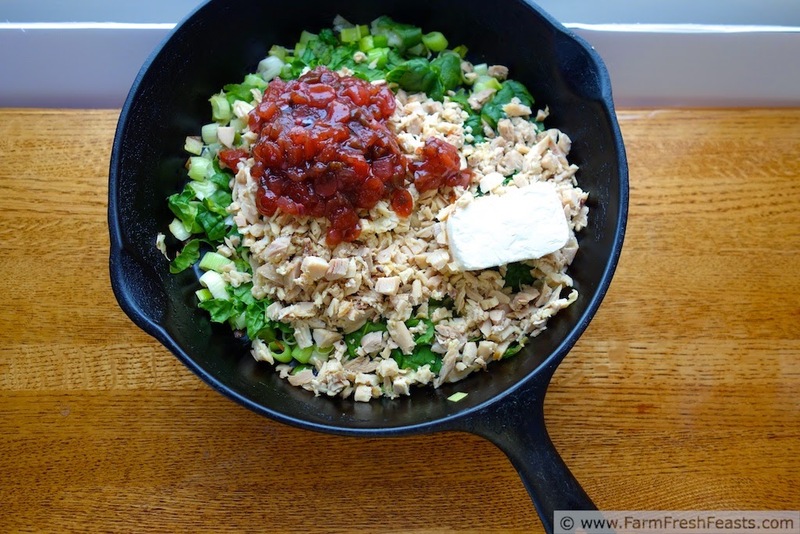 Stir in chicken, cream cheese, and salsa. Somewhat evenly divide the skillet mixture into 6 portions, and spread each portion down the middle of each of the tortillas. Add a generous pinch of shredded cheese to each tortilla (about ⅙ cup). 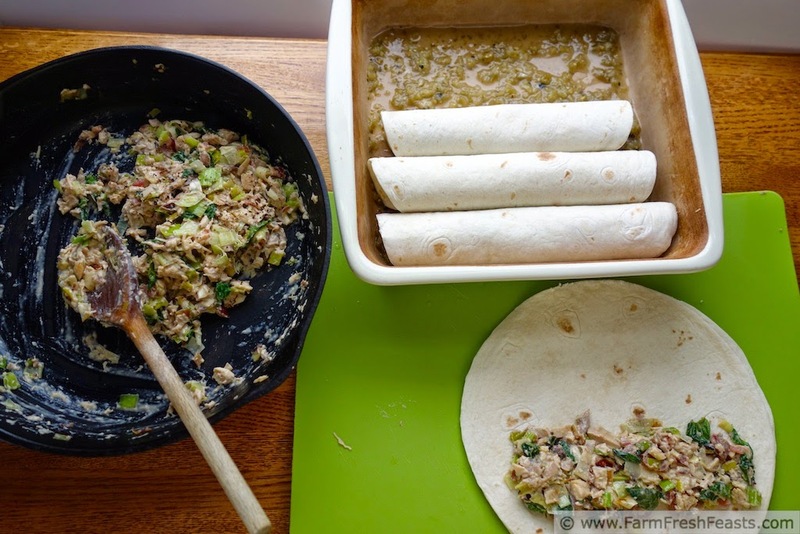 Roll up tortillas and place them, seam side down, into the prepared pan. Top with another cup of salsa verde, and the remaining 2 cups of shredded cheese. 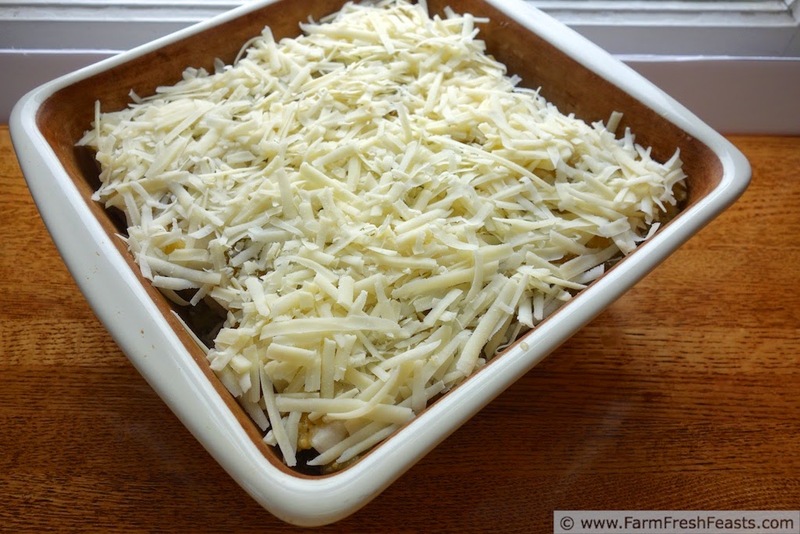 Bake for 25 minutes until cheese is melted and exposed tortilla edges are slightly crispy. 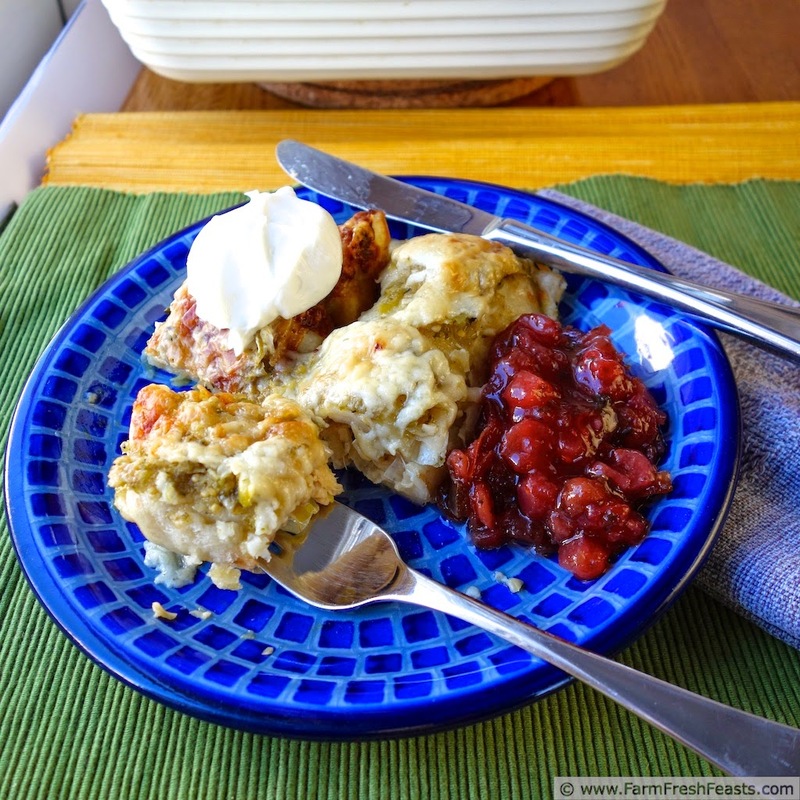 Serve with cranberry salsa, salsa verde, and sour cream if desired. I do need to make your enchiladas again. They were fantastic the first time, and I like your combination of flavors here. I can see how the chicken and cranberry would play well together. I still have leeks in the garden bed. They don't seem ripe (or thick) enough to pull. My farmer recommended covering them with leaves for the winter and taking a look next year. What do you think? Also, it is time for me to plant the garlic? As for leeks . . . I'm not sure. We'll learn along together. Like I regrow celery in a bowl on my kitchen windowsill (here's how: http://www.farmfreshfeasts.com/2013/02/broccoli-and-cheese-on-boboli-pizza.html) I'm attempting to re-grow leeks. The lovely leeks from my farm share had roots attached, so I cut off the bases and stuck them in a garden bed. The leafy leek part is 3-4 inches tall, so I think they like it. I don't know that they will grow much more before it gets too cold--so I'll pull one and snuggle one in leaves. Oh! 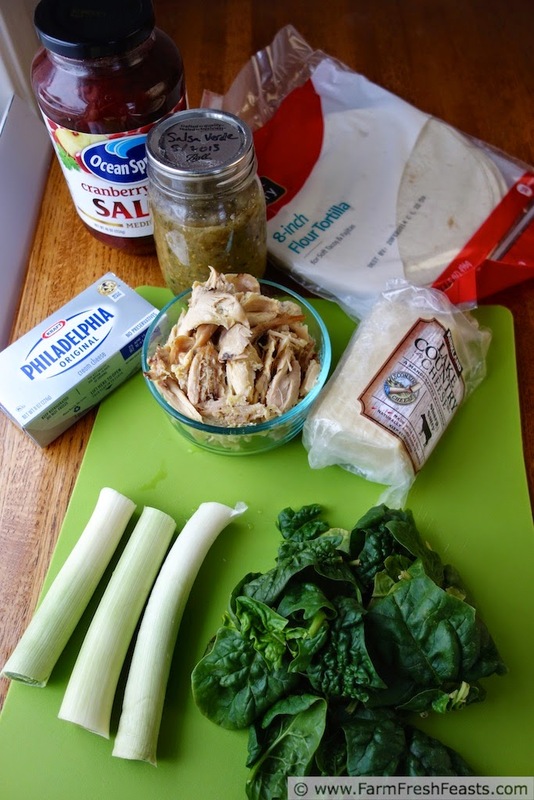 I almost forgot--I had to get this recipe published so I could share my next enchilada one--turnip and kohlrabi enchiladas. 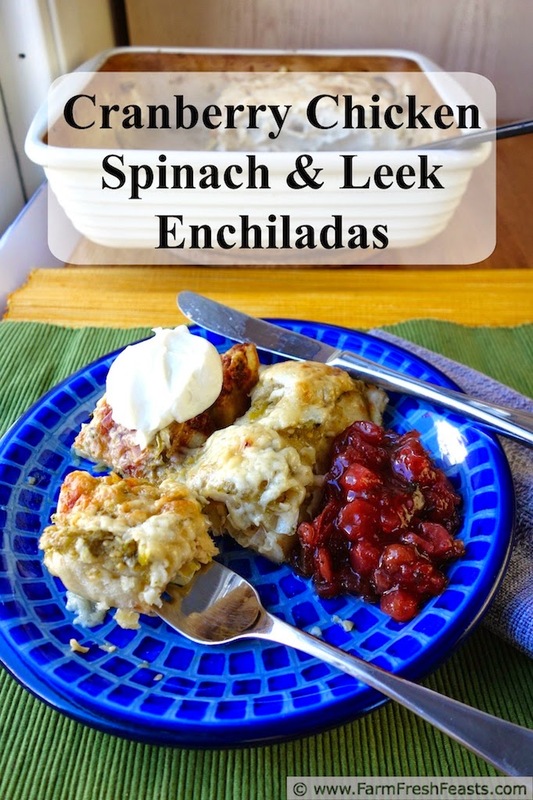 They are also delicious--and a winter version of my Easy Cheesy Vegetable Enchiladas.